The far-flung island nation of New Zealand first became officially politically united in 1835, when a confederation of Maori tribes declared its independence as a sovereign state. Five years later however, this independence was rescinded, and Great Britain began to colonize the islands. Much like Australia, New Zealand became a nation of self-governing transplanted European settlers, gaining the status of a Dominion in 1907 and of a formally independent state in 1947. 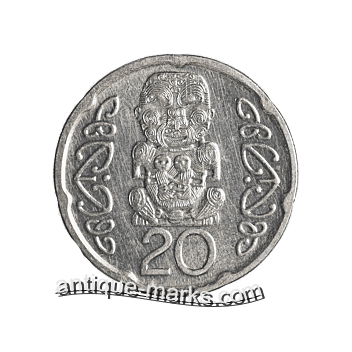 When compared with the variety and quantity of Australia’s silver currency issues, New Zealand’s silver coinage doesn’t measure up very well. Like Australia, New Zealand initially adopted the pre-decimal British pound sterling system and later switched over to the New Zealand dollar, her present currency. From 1840 to 1932 however, no New Zealand government coins or banknotes were issued on the islands. New Zealand’s silver coins, a regular series of silver coinage, only began in 1933 but only ran until 1946. All New Zealand silver coins of this period from the threepence to the crown were minted in .500, or 50%, fine silver. But after 1946, the government of New Zealand decided to remove all silver content from its coinage. In 1969, a commemorative version of the fifty cent coin featuring the Machin portrait was produced. It marked the bicentennial of the Endeavours arrival at New Zealand. Since no regular fifty cent coins were issued in 1969 the commemorative 1969 50 cent coin is rare. In 1994, a bimetallic fifty cent coin was issued to mark the 225th anniversary of the Endeavours arrival. This coin features the Maklouf portrait, which was used on British Commonwealth coins from 1985 to 1997, and is the only bimetallic coin issued by New Zealand. In 2003 six coins with the Monarchs Rank-Broadley portrait (first introduced in 1998) were released, that feature images of characters from The Lord of the Rings. New Zealand also issued collectible Silver dollars featuring Lord of the Rings characters. Despite its relatively short period of circulated silver coin production, New Zealand silver coins are still worth buying for their historical and collectible value. Collectors and fans of commemorative silver coins might also be interested in New Zealand’s series of beautiful and rare sterling silver dollars, which have been minted in very limited quantities since 1984. 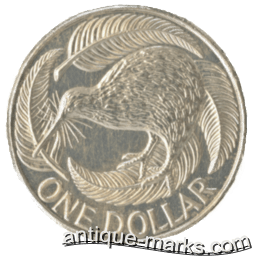 American and European silver collectors could have a hard time finding many affordable New Zealand silver coins though, as shipping rates on silver coins imported from New Zealand tend to be prohibitively high. So, if you’re new to collecting silver British Commonwealth coinage, you may want to start your collection by focusing on a different commonwealth country.